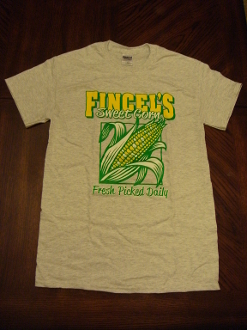 As we pick only the highest quality sweet corn for you, we'll help you represent Fincel's Sweet Corn with a high quality heavyweight t-shirt. Fincel's Sweet Corn ultra Cotton T-Shirt by Gildan, in Grey. Preshrunk 100% cotton jersey, seamless 7/8" collar, taped neck and shoulders, double-needle sleeves and hems, quarter-turned to eliminate center crease. Featuring our traditional Fincel's Sweet Corn logo. Show your support of Dubuque's own Fincel's Sweet Corn today! *Chest is measured one inch below arm hole. Body is measured from the hight point of the shoulder to the hem. Sleeve measurement starts at the cetner of the neck and measures down the shoulder, down the sleeve to the hem.